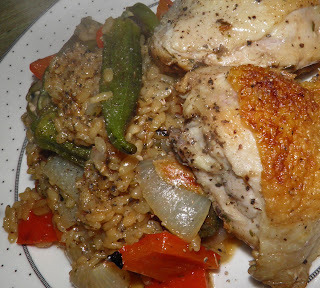 Okra and chicken and rice, oh my! People either love okra or hate them. But there’s more to okra than its use in gumbo. Have you ever seen an okra plant in bloom? I haven’t in person but I plan to rectify that if I can this growing season. The first time I saw a picture I couldn’t believe it. The flowers are beautiful. They look as exotic as hibiscus. 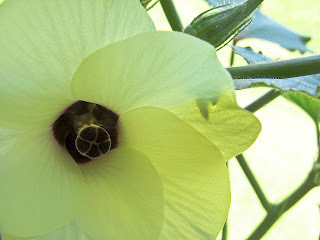 Okra is a flowering plant in the mallow family. We have mallows in Nova Scotia, but they’re nothing like this. Ours grow about 12 inches high. This particular mallow grows edible green pods. It is more at home in tropical, subtropical and temperate regions around the world than draughty old Nova Scotia. But it’s not impossible to grow them here. Vesseys sells “jambalaya okra” that matures in 50-60 days. ($2.95/pkg). That’s where ours will be coming from, unless I try to sprout the seeds from a grocery store pod. The problem with that is you don't know how long the growing season would be. Okra grows to 6 feet tall in the right conditions and has wide, palmate leaves. It can be grown as an annual or a perennial. I think it’s decorative enough to be enjoyed in a flower border. It is related to hibiscus, as well as cotton and cocoa. Okra is a bit of a nutrition bomb. It’s high in fiber, vitamin C, antioxidants and folate. It’s also a good source of calcium and potassium. Okra oil can be pressed from the seeds and is high in oleic and linoleic acid. The seeds can have an oil content of up to 40%. That’s high. Oil yields therefore are also high, potentially only surpassed by sunflowers. A 2009 study found okra oil suitable for use as a biofuel. But, as of now, it’s far more popular in your cooking pot – for those who like it. There’s one problem with okra, in some people’s minds. Okra is what is called mucilaginous, the term that describes the "goo" that emerges when the seed pods are cooked. That goo is a form of soluble fibre. So if you cook it a long time it disappears. If you want to minimize the goo keep the pods whole and cook briefly, like in a stir-fry. One common use of the goo is to thicken gumbo. 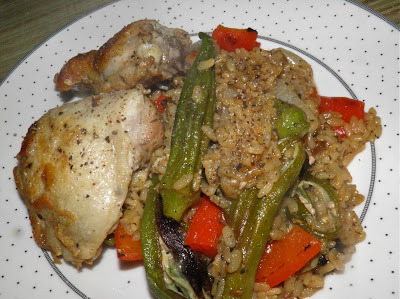 This recipe uses the thickening properties on the liquid used to cook the rice. This recipe is pretty good – kind of like a Cajun stew. Place the chicken bone side down in a dry, deep sauté pan with a lid. Sprinkle with salt and pepper. Let the chicken cook until some of the fat renders out and the pieces naturally release from the bottom. Turn and let the other side cook. Remove to a plate. Add the okra to the chicken fat and let cook until it begins to brown. Remove to a plate. Then add the.onion and pepper to the pan. Cook until the onions soften. 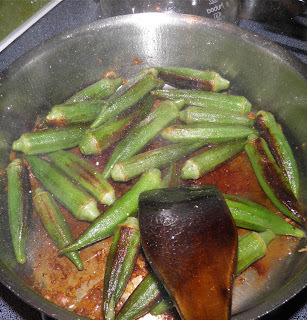 Then add the okra pods back in. Sprinkle the rice over the top of the vegetables and then pour in the water. Mix the spices and stir into the pot. Nestle the chicken on top, cover and let cook for 20-25 minutes, or until all the water has been absorbed. * The size of the okra depends on your tolerance for the "goo" factor. Smaller pieces will have less.